If Congress would choose to listen to people in poverty, rather than just talking about them, this is what they would hear. He had the perfect opportunity to do just that at a recent House Budget Committee hearing, “War on Poverty: A Progress Report,” which he chaired. California Democratic Congresswoman Barbara Lee requested that Chairman Ryan allow Tianna Gaines-Turner—a mother and anti-poverty activist who has struggled with poverty and homelessness—to testify. “Ranking Member Van Hollen previously selected a witness to testify, and I won’t be able to make further additions to the witness list,” he wrote in a letter to Congresswoman Lee. But the chairman could have made additions to the witness list had he truly wanted to—he simply chose not to. He did, however, permit Gaines-Turner to submit written testimony. The only problem with that is that written testimony normally sees about as much light of day as that old T-shirt with all of the holes that you keep in the back of your bottom drawer—the one you might take out again some day to workout in provided that no one you know is within ten miles of you. Gaines-Turner and her husband both work and have three children—a 9-year-old son on the honor roll in fourth grade, and 5-year-old twins who are entering kindergarten. All three of her children suffer from epilepsy and moderate to severe asthma. I worry about a day that might come where my children won’t be able to see a specialist because I can’t afford the co-pay.… Just like you want the best for your children I want the best for my children. We were both unable to work, so we lost money that month, and ultimately had to make a choice—do we pay the rent or do we pay the light bill? Not to mention, how do we buy food…? Poverty is not just one issue that can be solved at one time. It’s not just an issue of jobs, or food, or housing, or utility assistance, and safety. It’s a people issue. And you can’t slice people up into issues. We are whole human beings. Just when someone is moving forward, the rug is ripped out from under them. This cycle pushes people deeper into poverty than they were before they took the job. This system needs to change in order for people like myself to forge a better future for myself and my children, one where I will never need to turn to public assistance again. Like many of the Witnesses to Hunger I’ve had the opportunity to speak with, Gaines-Turner has particular expertise when it comes to food and nutrition issues. Witnesses to Hunger has chapters in four cities, including Gaines-Turner’s Philadelphia, where members use photography to document their experiences in poverty and learn to advocate for change on the local, state and federal levels. The reality is that SNAP keeps us from starving. It is critical to the survival of the 50% of American children who will rely on the program at some point in their lives…. If my benefits are cut that means less meals and less nutritious foods. Cutting a person’s benefits by $10, or $15, or $20 might not seem like a lot to legislators, but it would cut meals out completely for families like mine…. I would still feed my kids, but it would be cheap Oodles of Noodles with lots of sodium…. They would not get fresh vegetables and fruit. My family, friends, and community could have told you that years ago. But people wouldn’t believe us because they would somehow think it was our fault. The Institute of Medicine shows that it’s not our fault. It is the system we have that needs improvement. Gaines-Turner asserts that “the issues of medical care, housing, and food all go hand in hand.” She writes that she and her family have been homeless twice in recent years. When the twins were born, the first home they rented they chose simply because it was affordable. She said there were shootings and “children everywhere on this street.” There was also a “terrible rodent problem on the block—mice and cockroaches” which “are asthma triggers.” The family spent “too much money on an exterminator to no avail.” It wasn’t safe, so they used what little savings they had to live in a hotel or sleep on her mother-in-law’s couch. During this time the family was actually approved—after waiting for ten years—for Section 8 housing. But they didn’t know it. They tried to send the forms to our old address, but they had the spelling of the street wrong, so it never reached us. We didn’t know about this for months. And because we never responded, we were put back on the bottom of the wait list. All of the housing forms are still paper-based. It is a system that is still in the Stone Age. Yet there are still abandoned homes on our street, shootouts in the bar down the street, and several homeless people who stay under the bridge in the nearby subway. If you actually came into our communities, actually invited us to talk with you…you would learn that government benefits are actually helping us stay healthy. You would also see that helping each other out is exactly what we do, every day to survive. She describes how she and her neighbors recently received donated food and took it “to an abandoned house…and set up a place on the porch where people could come and get food…. If you were hungry, if you wanted food, we gave it to you.” She also checks in daily on an elderly neighbor who spends “her entire Social Security check [on] rent and utilities” and has little money left for food. Moments like these are not unique. They happen every day throughout our country. And if our government officials and policymakers took the time to really look at and try to understand the communities they are supposed to represent, they would see that. Include us. If you want to find solutions to the issues that people face while living in poverty, people actually living in poverty need to be part of the discussion when decisions are being made. If you do not have an understanding of the struggles, how can you try to solve them…? We are the real experts. We know American policies first hand. We invite you to come to Philadelphia to see where and how we live, to come to our grocery stores, childcare centers, and elder homes, and to visit with my neighbors. And then we can talk like equals, and join in the idea of putting poverty in the past, of investing in helping American people do and be their best. It’s the patriotic thing to do. I hope the Committee takes Gaines-Turner up on her kind invitation. You can read her testimony in its entirety here. The NYC Coalition Against Hunger has launched www.HungerVolunteer.org to provide you with tools to make the greatest impact in the fight to end hunger. The site provides volunteers and anti-hunger organizations with comprehensive information on how to reduce hunger in communities. There is also a tool to match your skills with particular volunteer opportunities. Join the movement to end hunger in America and find a volunteer opportunity near you today. From the Coalition on Human Needs: During August recess, tell your representative and senators that it is harmful and wrong to continue or worsen cuts to Head Start and education, meals for seniors, rental housing vouchers and homelessness prevention, unemployment insurance, healthcare or other vital services. It is also wrong to cut our most basic anti-hunger, healthcare and Social Security safety net programs. E-mail Congress: No More Sequester and No SNAP Cuts. From Catholic Charities USA: With comprehensive immigration reform still a very real possibility, this is a critical time for all seeking a more fair and just treatment of those who have come to our country seeking a better life. Call on your elected officials to pass bipartisan immigration reform that preserves and protects family unity and provides a pathway to citizenship for undocumented persons living in the United States. Take Action: Use the August Recess to Support Comprehensive Immigration Reform. The Half in Ten Campaign and the National Transitional Jobs Network are collecting stories that show how on-the-job training, transitional jobs, subsidized employment programs and youth employment programs all help low-income Americans get the training they need to succeed. Help make the case for investments in these jobs programs, share your story today. MoveOn.org Petitions: Sequestration cuts to housing assistance programs will increase the number of homeless individuals and families, which will cost taxpayers more in the long run. Exempt Housing Assistance from Sequestration Cuts. Next week, August 11–17, is National Health Center Week (#NHCW2013). Community health centers are one of our nation’s most effective (and cost-effective) responses to poverty. They not only provide high-quality, affordable primary and preventative healthcare to over 22 million people in medically underserved communities but also work to address other factors that relate to health and well-being such as nutrition, unemployment and homelessness. 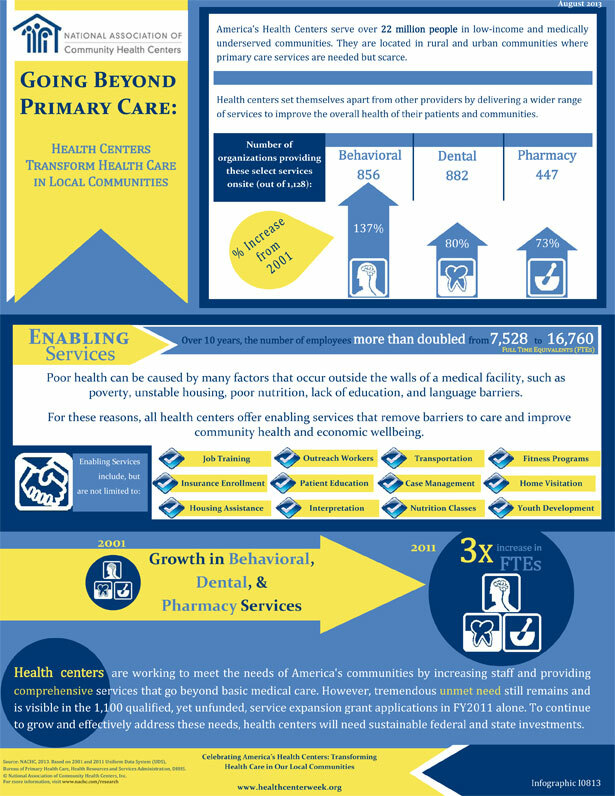 Community health centers offer a proven model with a nearly fifty-year track record, save in long-term healthcare costs and need to be expanded. Community Action Partnership’s 2013 Annual Convention (August 27–30, Marriott Chicago Downtown Magnificent Mile Hotel) More than 1,000 human services professionals from Community Action Agencies will attend this year’s convention. It will focus on a variety of topics affecting low-income people, including food insecurity, affordable housing, Head Start and healthcare. Presenters include Katie Wright and Erik Stegman of Half in Ten, Deborah “Jedi Master” Weinstein of Coalition on Human Needs and Ellen Teller of Food Research and Action Center. There will also be screenings of American Winter and A Place at the Table. For more information, go to www.communityactionpartnership.com or follow@CAPartnership. “Student Debt and the Value of a College Degree,” by Hans Johnson, Marisol Cuellar Mejia, David Ezekiel and Betsey Zeiger. Public Policy Institute of California, June 2013. This report assesses the cost of college education and its long-term benefits in California. In the first decade of this century, the percent of incoming college freshmen in California taking out loans increased significantly as did the average loan size. As the authors of this report stress, this is “not because the institutions are becoming less efficient. In California, reductions in state support have been unprecedented, with total general-fund contributions to [public universities], and the community colleges falling by one-third between 2001–02 and 2011–12.” However, getting a college diploma is still a sensible investment for most students; college graduates are more likely to be employed with stable work and earn substantially more money. The report also outlines policy recommendations, like providing affordable loans and limiting loan eligibility at for-profit institutions. Be sure to check out the data on the how the economic return of college varies by major. “The Rise of Single Fathers,” by Gretchen Livingston. Pew Research Center, July 2 2013. Today, about one-third of children live in single-parent households, a marked increase from fifty years ago. This report examines the significant rise in the number of single-father households during this period—about nine-fold since 1960—compared to a four-fold increase in the number of single-mother households. Both single fathers and single mothers are younger, poorer, less educated and less likely to be white than their married counterparts. However, on other indicators single fathers fare much better than single mothers; for example, whereas about 43 percent of single mothers are living at or below poverty level, about 24 percent of single fathers endure the same hardship. Another interesting fact: black men are the most likely (29 percent) to head single-parent families, compared to 20 percent of Hispanic men and 14 percent of white men. “Suburban Poverty Traverses the Red/Blue Divide,” by Alan Berube, Elizabeth Kneebone and Jane Williams. Metropolitan Policy Program at Brookings, August 6 2013. In their recent book, Confronting Suburban Poverty in America, the authors explore the rapid rise of suburban poverty in the past decade and the federal government’s continuing focus on the urban poor. This briefing paper outlines their findings and delineates which congressional districts are most affected by suburban poverty. Here is one example: “Democrats still represent poorer suburbs than Republicans on average, but the gap has narrowed.” Congressional District 12 in North Carolina (D, Rep. Melvin Watts) had the biggest percentage change in the suburban poor population, and Congressional District 7 in Indiana (D, Andre Carson) had the biggest increase in the suburban poverty rate (all data from years 2000 and 2007–11). The authors suggest that the rapid increase in suburban poverty across both red and blue congressional districts might well facilitate bipartisan cooperation on the issue. “Separate & Unequal: How Higher Education Reinforces the Intergenerational Reproduction of White Racial Privilege,” by Anthony P. Carnevale and Jeff Strohl. Georgetown Public Policy Institute, July 2013. The opening sentence of this report says it all: “White flight from the center city to better neighborhood schools in the leafy green suburbs has finally arrived on the nation’s ivy-covered college campuses.” The authors have done an admirable job quantifying the growing concentration of white students in the nation’s most well-funded, selective four-year institutions, while lower-income African-American and Hispanic students are increasingly crowded into less selective, low-tuition two- and four-year colleges. While racialized differences in preparation are important, they do not completely account for these diverging trends: “Whites, African Americans and Hispanics who score in the top half of the SAT/ACT test score distribution go to college at the same rate (90%). Yet whites have higher graduation rates and graduate school attendance because they attend more selective colleges.” The section on the unique negative impact of race on college and career opportunities is particularly interesting. Children in poverty: 16.4 million, 23 percent of all children, including 39 percent of African-American children, 37 percent of Native American children, 34 percent of Hispanic children, and 14 percent of both Asian and Pacific Islander and non-Hispanic white children. —Tianna Gaines-Turner, written testimony to House Budget Committee. 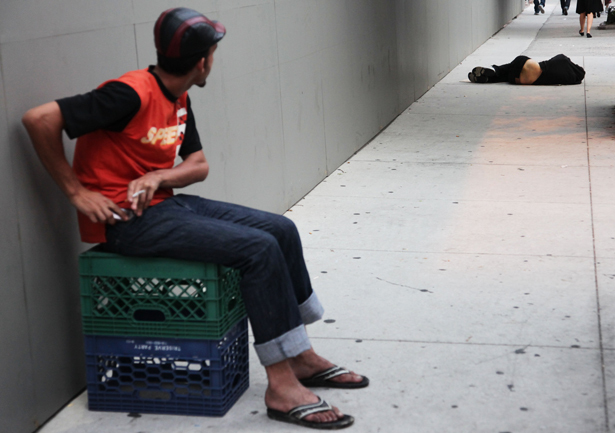 This Week in Poverty posts here on Friday mornings, and again at Moyers & Company and AlterNet. I’m taking off next week so will next post this blog on August 23. You can e-mail me at WeekInPoverty@me.com and follow me on Twitter. How did the “opt-out revolution” change men?